Hiring an experienced mesothelioma law firm is essential in filing a successful asbestos claim. Get help finding a law firm near you. Choosing an experienced law firm can help ensure you receive compensation. A reputable firm will have extensive knowledge, resources and proven results. A free case review with a law firm can help you learn more about your legal options. Browse our partners to easily connect with a top mesothelioma law firm. The dire effects of asbestos exposure continue to impact thousands of families across the country. The companies who put so many lives at risk should be held responsible. If you or a loved one has been diagnosed with mesothelioma, you have legal rights and may be eligible for compensation. Deciding to pursue legal action against the asbestos companies that caused your exposure is a big decision and requires the help of an experienced mesothelioma law firm. Finding a reputable mesothelioma law firm is one of the most important decisions you can make. Only a law firm with mesothelioma attorneys who have strong experience in asbestos litigation will have the knowledge necessary to properly navigate your claim process and ensure you get the financial compensation you deserve. Asbestos litigation can be very complex, and for many mesothelioma victims it can even be difficult to know how asbestos exposure occurred in the first place. By working with knowledgeable mesothelioma attorneys, you can better understand all your legal options and what type of mesothelioma claim makes the most sense for your individual circumstances. Your lawyer will be able to research the details of your case, determine the best venue to file your claim, and handle the entire process on your behalf so you can focus on your health. Choosing a mesothelioma law firm to work with is a very personal decision. As you research and consider what mesothelioma law firm you want to work with, there are certain qualities and characteristics you should keep in mind to help ensure your claim is ultimately successful. Asbestos was widely used for decades, so it can be difficult for the average person to be aware of the extent of products and places that likely contain the toxin. Finding a mesothelioma law firm that has extensive knowledge of all of the companies that manufactured, distributed or utilized asbestos in their processes is essential for building your case. Without such a breadth of information on top of extensive background in asbestos legislation, it can be difficult to determine where your exposure occurred and who can be held liable. Your asbestos attorneys should also have a strong knowledge of asbestos-related diseases, particularly mesothelioma. Having a thorough understanding of these diseases will not only help your lawyer make a stronger claim, but will also help them be more empathetic with your needs and desires as you face mesothelioma cancer. Attorneys who are also up-to-date on the latest studies, including new treatments and clinical trials, can also help you beyond the courtroom or asbestos claims process. Seeking the help of experienced mesothelioma lawyers is a vital step in securing yours and your family members’ financial well-being. An experienced law firm will have a breadth of knowledge on what to expect from the defendants throughout the claim process from years of working with other asbestos victims. Whether it’s mesothelioma lawsuits and handling out-of-court settlements or filing claims against asbestos trust funds, your law firm should have years of experience handling all the different types of asbestos claims. They will also be able to guide you through the different types of claims and paths you may be eligible to take to maximize your compensation and complete the legal process in the most efficient manner possible. Going to any law firm that handles a wide array of cases can ultimately hurt your claim. These law firms may not have the ability to provide the personal attention necessary to build your case thoroughly. Firms that dedicate all or nearly all of their resources to mesothelioma and asbestos cases enables lawyers to stay focused and understand of the complexities of each unique claim. Choosing a national law firm where a claim can be filed anywhere in the United States will also be beneficial to ensure the best venue for your claim doesn’t become limited. You may also be able to determine the dedication and resources of a particular firm based on their initial offerings. Many law firms offer a free case consultation, which lets you explore your legal options and your eligibility for a successful claim. Further, reputable law firms operate on a contingency fee basis, meaning you will only pay your lawyers if your case is successful and compensation is recovered. Experienced law firms will operate with streamlined resources that will know how to keep costs to you down, and achieve results efficiently. Asbestos-related diseases like mesothelioma are costly to diagnose and treat, and can become a financial burden that causes some to even consider forgoing treatment altogether. Rather than making such a difficult health decision or worrying about affording such high medical expenses, trust a mesothelioma law firm that has a solid track record of success. The asbestos attorneys you choose should be dedicated to fighting for the compensation you deserve, with successful jury awards and settlements to back up their efforts. Though a trustworthy law firm can not guarantee results, they should be able to advise you on the legitimacy of your claim and what you can potentially expect as your progress through the legal process. The Mesothelioma + Asbestos Awareness Center partners with several leading mesothelioma law firms to enable patients and their family members the opportunity to easily seek out a free case review and learn more about the legal process. Early, Lucarelli, Sweeney & Meisenkothen (ELSM) has over 40 years of experience in mesothelioma cases, and have helped thousands of asbestos victims receive the compensation they deserve. ELSM has achieved national recognition for their dedicated compassion and legal representation of mesothelioma victims. The firm has also been awarded Martindale-Hubbell’s highest AV rating for excellence in legal expertise and ethical standards. This top rating is driven by feedback from clients and peer review of the firm’s lawyers in areas including expertise, knowledge, communication and ethics. Gori Julian & Associates, P.C. is a national law firm with over 20 years of experience in asbestos litigation. The attorneys have handled hundreds of mesothelioma cases and thousands of asbestos claims all over the country. 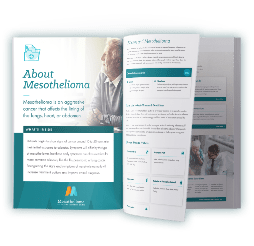 In addition to handling the legal process, the legal team is dedicated to being a source of support for patients, also helping provide information on mesothelioma doctors and support services. Simmons Hanly Conroy has helped thousands of clients across the country recover financial compensation through asbestos claims. Their legal team is committed to helping give a voice to mesothelioma victims and their families.